If you don't want to install one of our apps, you can use Basecamp through your mobile browser! Since it's designed for speedy access, the mobile version of Basecamp doesn’t do everything the full version does. In the mobile version, you can see everything in your account: every project, your Daily Progress, discussions, to-dos, text documents, forwarded emails, attachments, and files. You can post and edit messages and comments. You can add, edit, and check-off to-do tasks. You can search your account and switch between accounts if you need. You can create and edit text documents. The mobile view doesn't have an Everyone page, but you can see all the people in each project. You can’t move or copy items, reorder to-do lists, add files to to-dos, or edit file names. But never fear! Switching views gives you the full functionality of your Basecamp account. It won't fit as elegantly on the smaller screen, but you'll get see all your favorite features. You can switch back and forth between the mobile and standard version as needed. Another helpful option is the Email-In feature. Look for the “Email content to this project” in the menu at the top of every project in the mobile version of Basecamp. Use Email-In to create new to-do lists and text documents. 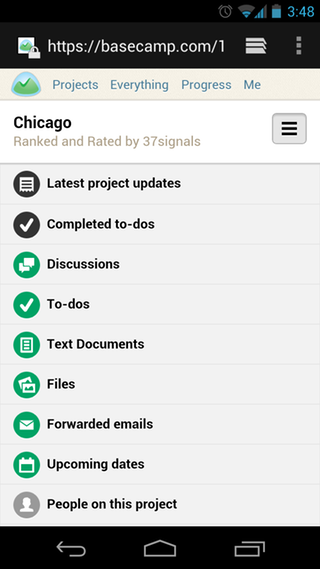 You can also email files from your mobile devices right to your projects. It's a great option for adding stuff to your projects on the go! The Windows phone won't let you upload files in the browser -- email-in is a great workaround!